On this disc, Prélude à l’après-midi d’un faune – possibly Claude Debussy’s most popular work for orchestra – is framed by two of his greatest achievements in the medium, La Mer and Images pour orchestre. All three works are programmatic, but Debussy’s concern was to create an atmosphere rather than any naturalistic likeness. The Prélude is a case in point – while taking his inspiration from a pastoral poem by Stéphane Mallarmé, Debussy famously told a conductor who wanted a more detailed explanation: ‘It’s a shepherd playing the flute, sitting on his bum in the grass!’ In La Mer, Debussy abstains from the various clichés of so many other musical depictions of water, and instead creates an immediately recognizable seascape, largely through a pioneering use of various instrumental timbres, once described as ‘an impressionism of sounding dots’. Soon after La Mer, the composer started on Images, in which he went even further: although using a large orchestra, Debussy mainly avoids big sonorities, concentrating instead on unusual sound combinations and on transparency. His aim was compose a cycle focusing on the colours of three countries, while as far as possible avoiding the clichés associated with their music. Of its three panels, the expansive middle one, Ibéria, is often performed as an independent piece, but its Spanish colouring takes on new shades when framed by Scottish mists and the freshness of spring in France. 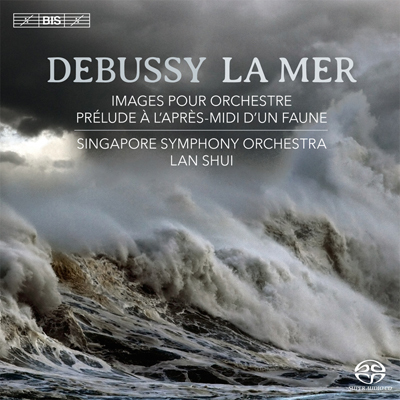 The present disc combines new recordings by Singapore Symphony Orchestra and Lan Shui with the team’s acclaimed performance of La Mer, first released in 2007 on Seascapes, a programme of sea-related works. The reviewer in American Record Guide called it ‘the most astounding, effective, and beautiful recording of La Mer I have ever heard’ and in BBC Music Magazine it was described as ‘an unequivocally world-class performance’.